Multiparticulates (MPs) offer a high degree of capability and flexibility for attaining pharmacokinetic (PK), pharmacodynamic (PD), or target product profile goals. Reasons to use MPs in fixed-dose combinations (FDCs) include the ability to (1) mix and match release profiles for enhanced PK or PD effects; (2) isolate chemically incompatible active pharmaceutical ingredients (APIs); (3) lower costs or simplify handling and distribution of the FDC relative to two or more separate materials; and (4) maximize commercial opportunities by serving new indications or capturing market exclusivity through improved efficacy and compliance. 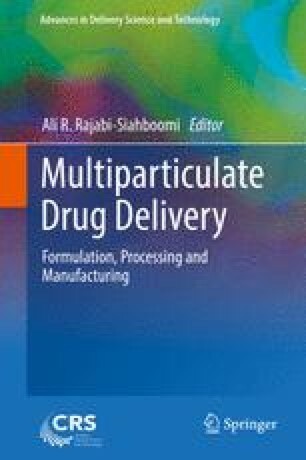 The primary goals of this chapter are to (1) review the state of the art for MP usage in FDCs and (2) use case studies or hypothetical combinations to describe formulation efficacy improvements enabled through MP usage in FDCs. The authors would like to thank Marco Vincenti and Jim Coward for the market research and Ann Malkin for editing assistance. Takeda Pharmaceuticals. Last update 2014. Dexilant. Available at: www.dexilant.com. Accessed June 2014. Capsugel. Last update 2014. Duocap capsule-in-capsule technology. Available at http://capsugel.com/en/products-services/products/capsules/duocap/. Accessed June 2014. Catalent. Last Update 2014. OSDrC optidose drug delivery technology. Available at http://www.catalent.com/index.php/offerings/A-Z-Offerings/OSDrC-R-OPTIDOSE-drug-delivery-technology. Accessed June 2014.
http://www.janssen.com/us/sites/www_janssen_com_usa/files/products-documents/pi-sporanoxcapsules.pdf, website accessed 17 Feb 2016.